May is the perfect time of year to refresh your bedding for the warmer months. Whether you like warm and cozy or cool and crisp, your bedding should make you feel comfortable in any season. But if you’re shopping for sheets and pillowcases based on thread count alone, you’re missing out on other factors that will give you the feel you’re hoping for. Linen duvet cover with our Cable Weave blanket. 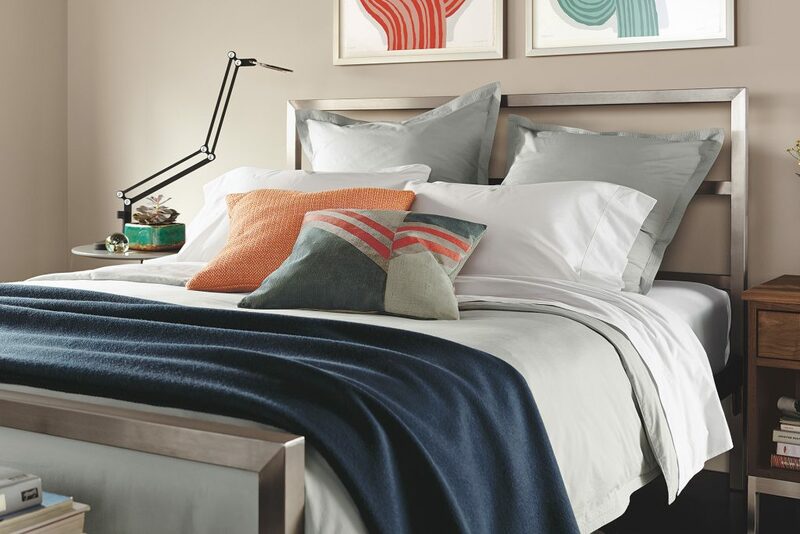 Let’s start with the popular notion that a higher thread count equals better quality. Thread count measures the number of yarns per square inch. However, if your bedding is high-quality, long fiber yarns, the thread count can be lower and still give you a smoother, softer feel. In fact, many low-quality sheets can boast a high thread count simply because the yarns are so short, the sheet needs more of them—and you’ll feel it in a rougher texture and pilling after repeated washings. Generally, it’s accepted that if your sheets are made from long-fiber, 100 percent cotton, you can find a great feel and long-lasting quality in thread counts within the 200-400 range. Buying a higher-quality cotton also gives you a better value in the long run. The fibers will stand up to repeated washings and even become softer and more relaxed over time. Our Percale sheets and bedding shown in Slate and White on our Portica bed. Finally, the weave of your sheets will affect the texture—and it’s all a matter of personal preference. 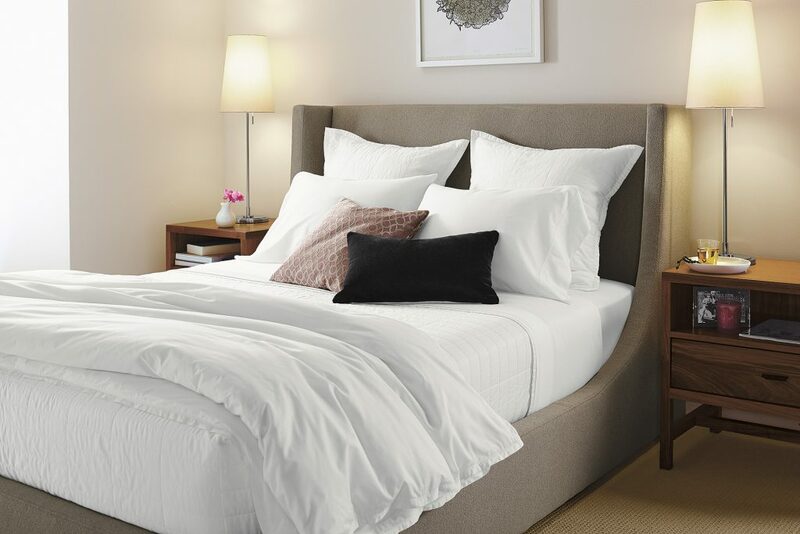 A percale weave creates a crisper, more structured texture, and generally feels cooler. Our Percale bedding is made using those long cotton fibers, so the sheets will soften over time, but still retain that slightly stiffer hand. A sateen weave will feel smoother and a bit warmer. 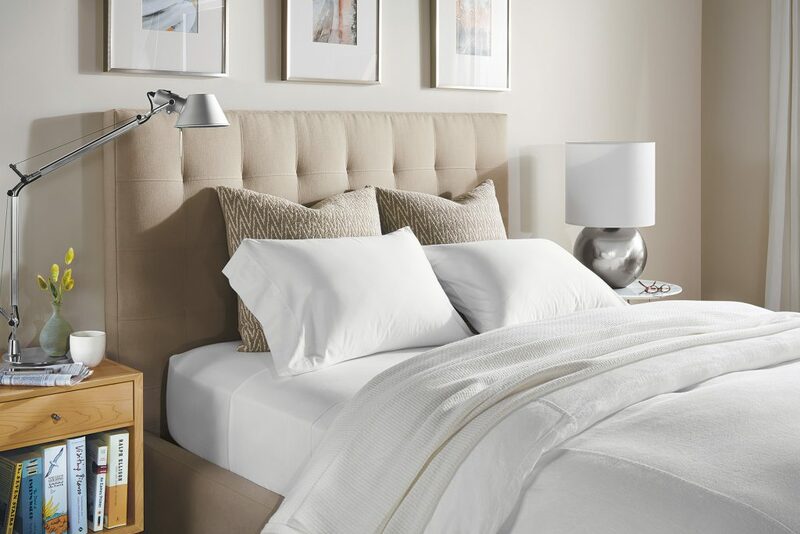 While some lesser-quality sateens use a poly-cotton blend to attain that silky texture, our Sateen sheeting is 100 percent cotton, so it will stay soft and breathable wash after wash.
Our Sateen sheets and bedding shown in White on our Marlo bed. Our bedding collection creation is careful, to give you just the right combination: high-quality fibers in a mixable, modern palette that help you rest comfortably night after night. Visit our stores to experience our bedding for yourself, or contact our Shop From Home team for free bedding samples so you can compare textures before you buy.